sister projects: Wikipedia article, Commons gallery, Commons category, quotes, Wikidata item, Wikilivres page. American novelist, short story writer, and journalist. His distinctive writing style is characterized by terse minimalism and understatement and had a significant influence on the development of twentieth century fiction. 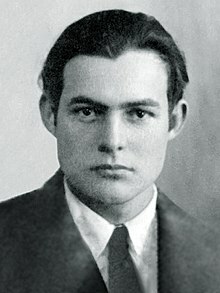 Hemingway's protagonists are typically stoics, often seen as projections of his own character—men who must show "grace under pressure." Many of his works are now considered classics in the canon of American literature. He received the Pulitzer Prize in 1953 for The Old Man and the Sea, and the Nobel Prize in Literature in 1954. It is imperative that contributors search the renewal databases and ascertain that there is no evidence of a copyright renewal before using this license. Failure to do so will result in the deletion of the work as a copyright violation. The author died in 1961, so works by this author are also in the public domain in countries and areas where the copyright term is the author's life plus 50 years or less. Works by this author may also be in the public domain in countries and areas with longer native copyright terms that apply the rule of the shorter term to foreign works. The author died in 1961, so works by this author are in the public domain in Canada because, according to Canadian copyright law, all private copyrights expire fifty years after the year marking the death of the author. Works by this author also in the public domain in countries and areas with longer native copyright terms that apply the rule of the shorter term to foreign works. This page was last edited on 16 April 2019, at 21:47.